Purchase any Endless Salt Water Pool in the month of April and you’ll receive a Maintenance Product Package FREE! With $400 worth of products April is the perfect time to make your backyard Endless. Call (03) 8769 7300 NOW to speak to a pool consultant and request a quote. 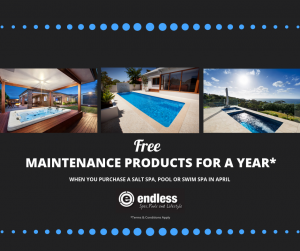 A Free Maintenance Product Package will be supplied with any new purchase of an Endless Salt Water Pool during the month of April 2019. The Maintenance Product Package will be supplied at time of delivery of the pool. All free onsite pool cleans must be used within 12 months of installation. The maintenance package is limited to the specified products by Endless and does not include future supply of any products. This Promotion is not in conjunction with any other offer. Promotion ends 30/4/2019.